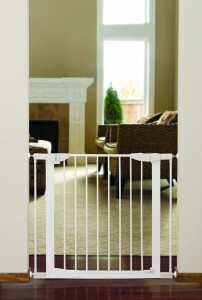 This Munchkin auto-close metal gate is ideal for top and bottom of stairs or between rooms. It has a walk through design ideal for high traffic areas. It’s auto close feature that ensures that the door is safely shut makes this particular design ideal for busy parents. It is pressure mounted and can be mounted using wall-cups for secure installation especially when used at the top of stairs. It is easy to assemble and fits openings from 29.5 inches to 38 inches wide. 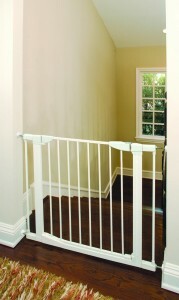 The gate is sturdy featuring U-frame steel construction with a white clean finish. It has an extra wide door for easy back and forth movement measuring 21.5 inches wide. The door swings open in either direction. It has double-lock childproof handle that’s difficult for children to open but easy for an adult. Its auto close feature allows the door to shut firmly when released by means of a hinge mechanism that relies on gravity in order to have the door to shut by itself. It fits wide openings from 29.5 inches to 38 inches and measures 29.5 inches in height. It comes two 2.75-inch extensions included and other optional extensions measuring 5.5 inches and 11 inches are sold separately here. This gate is a favorite for many parents who like the automatic closing feature since they do not have to re-latch the gate physically especially when their arms are full of laundry, baby, or other items. The fact that it can be hardware or pressure mounted makes it ideal for use at different areas at your home. The adjustable width makes it fit for different size and styles of openings. The installation is easy and many consumers like how sturdy the frame is. Most consumers feel that the gate usually is a bit noisy when it closes by itself. However, many appreciate that the noise is usually a reassurance that it has closed properly in order to keep the baby safe. To minimize the noise, you can slow it down as it is closing to avoid waking up the baby. Some consumers have mentioned that the bar that runs along the bottom of the gate may cause tripping over if used at the top of the stairway. This Munchkin gate has many positive ratings with consumers commenting about its automatic closing feature, how easy it is to install and the fact that it a fairly sturdy metal gate. It has an average rating of 3.5 out of 5 stars. If you are looking for a gate with the ability to close automatically so that your baby is safe at all times, then this gate is worth mounting at your home.